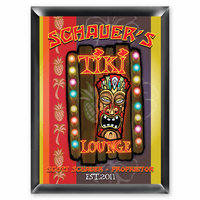 FEATURES/SPECS Do you know a tough guy with a home bar? 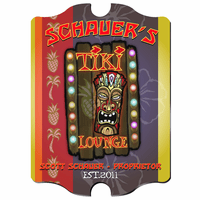 Well, this is the personalized bar sign for him! 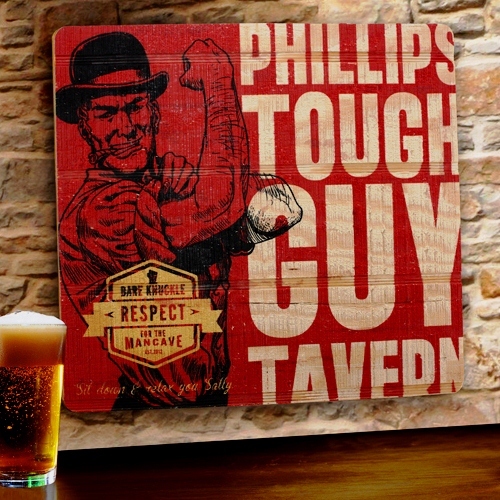 It features an image of an old time tough guy with his sleeves rolled up, ready for trouble. 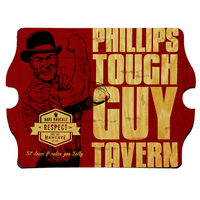 you'll personalize it with the recipient's name, listing them as the owner of this tough guy tavern. The shield includes the words Bare Knuckle Respect For the Tavern and down at the bottom is the funny quote, "Sit Down & Relax You Sally." This personalized tough guy bar sign comes with all the hardware you'll need to hang it, although your tough guys may want to use his own tools! 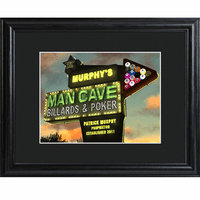 Comes painted with the words "Bare Knuckle Respect For The Man Cave" and "Sit Down & Relax You Sally"